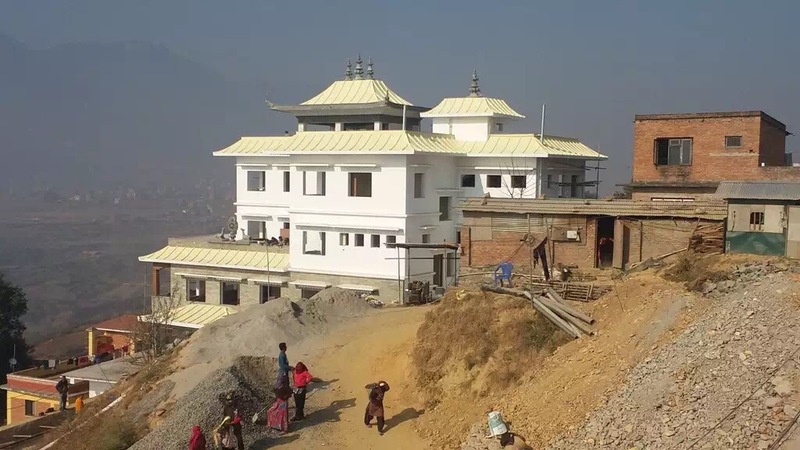 A donation of any amount will help complete the Nun’s Retreat Center, Pema Chodron Drubde, in Pema’s honor. Tsoknyi Gechak Ling is a small Buddhist nunnery in the village of Chobhar, in the foothills near Kathmandu, the capital of Nepal. About 100 nuns live at Tsoknyi Gechak Ling, having fled Tibet in an effort to continue their meditation practice and study and keep their tradition alive. 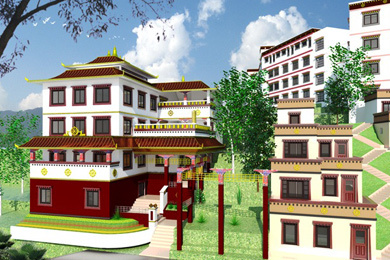 The nunnery is named after Tsoknyi Rinpoche, the nun’s teacher, and a Buddhist teacher well known around the world. The nuns had fled to Nepal after having been forced out of Tibet by the decades-old Chinese occupation there. As a result, their tradition is in peril. Now, Pema, along with Tsoknyi Rinpoche, wants to ensure that these nuns receive the same quality of training, and the same opportunities to flourish, just as monks have always had. Although monks in Tibet have also faced extraordinary hardship at the hands of the Chinese, nuns have experienced yet greater intolerance. As a result, their numbers are dwindling. The long tradition of intensive study and strict meditation retreat has made these nuns some of the most accomplished in Tibetan history. From the 12th century, nuns in Tibet have played a key role in preserving the Buddha’s teaching and the tradition of monastic life. Before the Chinese invasion of Tibet in the 1950s, there were at least 818 nunneries and about 28,000 nuns living in Tibet. During the first years of invasion, the Chinese People’s Liberation Army destroyed nearly all of the nunneries and forced thousands of nuns into labor camps, where they were tortured, or killed. Others perished from starvation and exhaustion. The destruction of monasteries and nunneries throughout Tibet and the persecution and harassment of monks and nuns there continues to this day. The tradition of the Tsoknyi Nuns (also known by their longer name as the Tsoknyi Nuns of Nangchen as they are from the Nangchen region in in eastern Tibet) has been so extensive that this lineage of nuns, the Tsoknyi lineage, is threatened with extinction. In 1999, a group of these nuns trekked from their home in Nangchen to Kathmandu – a journey of hundreds of miles across the harsh Tibetan Plateau and over the snowcapped Himalayan Mountains – to meet Tsoknyi Rinpoche, and to implore him to help them. Their situation in Tibet under the Chinese communist government had become unbearable if not life threatening. They were desperate to find a new and safer place to continue their tradition. 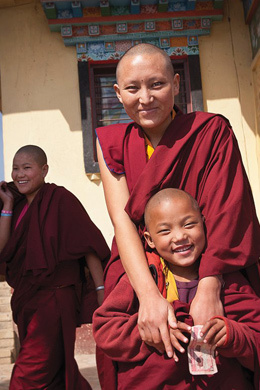 To care for the nuns at that time, Tsoknyi Rinpoche established the Gechak Changchub Nuns Meditation Retreat Center in Pharping, a small village just outside the Kathmandu Valley. The first group of 23 nuns was able to complete a strict three-year retreat in a farmhouse there. In 2010 Tsoknyi Rinpoche visited his ancestral home in the Nubri region of Nepal for the first time since he was young. Nubri lies at the base of Mt. Manasalu, the eighth highest mountain in the world, on the border with Tibet in northern Nepal. The beauty of the region is matched only by its harsh conditions and the poverty of its people. Following Tsoknyi Rinpoche’s invitation, about 100 young girls followed him to Chobhar, to be educated and trained as nuns at what is now called Tsoknyi Gechak Ling nunnery. At present, there are some 40 senior nuns and 82 younger nuns living, studying, and practicing at Tsoknyi Gechak Ling. 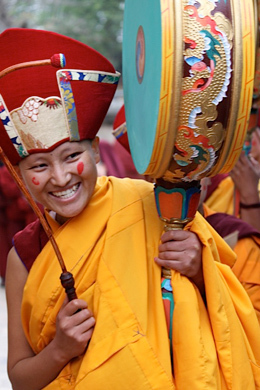 Another 100 girls from Tibet and Nepal aspire to come to the nunnery. However, because of imited space and inadequate finances, this is not possible now. When Tsoknyi Rinpoche expressed his wish to build a three-year retreat facility for the nuns, Pema decided to help. This wouldn’t be the first time she contributed to such a daunting but important endeavor. In the 1980s, she oversaw the creation of the three-year retreat center at her home monastery, Gampo Abbey, in Nova Scotia, Canada, and was in the first group to complete the retreat. Pema believes that to make it possible for these extraordinary and deserving nuns to fulfill their own aspiration for monastic training would be the perfect way for her give back to the tradition that has so profoundly transformed her own life and, through her teachings, the lives of thousands of others. With the help of many of Pema’s friends and supporters, the Pema Chodron Foundation has raised over $300,000 to build the three-year retreat facility. It is currently under construction. The nuns there have asked that the retreat center be named ‘Pema Chodron Drubde’, (Pema Chodron Retreat Center). The center will have accommodations for the nuns, a meditation hall, kitchen, and dining facilities, as well as separate wing that will accommodate shorter retreats for those not yet ready for three year retreat. With most of the funds already having been raised for the building of the retreat center, we’re now turning our attention to the support of the nuns in their retreat. This will cost an estimated $20,000 each year. Please consider contributing what you can to help these nuns to fulfill their dreams to practice and preserve their lineage. By contributing, you will help insure that this remarkable tradition will be passed down to their students, and their students’ students, for years to come.